When people at cocktail parties used to ask Charles Schmuttenmaer what he did, he would say he was a chemistry professor who worked on transient-photo conductivity in gallium arsenide. "At that point they would generally ask me to pass the chips," the Yale chemist says with a laugh. Now Schmuttenmaer tells them he's working on a way to harness the power of the sun to produce carbon-neutral fuel. "And then the response is, ‘Oh, that's wonderful. Way to go!'" he says. A few years ago, Schmuttenmaer never imagined he'd be working to solve the world's energy problem. But that's exactly what he now does as one of the four founding members of the Yale Solar Group — a team of chemists trying to use sunlight to split water into its elementary components: hydrogen (a green fuel) and oxygen. In doing so, they hope to pave the way for the development of photoelectrochemical cells that could be used to generate an environmentally benign transportation fuel. It's a challenge two of the team members — Yale chemists Gary Brudvig and Robert Crabtree — have been working on for the past 25 years, studying the process of photosynthesis and how to replicate it in artificial, "biomimetic" systems. Four years ago another Yale scientist, theoretical chemist Victor Batista, began creating computational models of molecules that could absorb visible light and make oxygen from water. The models suggested the possibility of developing artificial photosynthetic systems based on molecules studied by Brudvig and Crabtree and on semiconductor materials that had been studied by Schmuttenmaer, an expert in laser spectroscopy. "We decided that maybe the time was right to join forces and put everything together," Brudvig says, recalling the early days of the collaboration that has become the Yale Solar Group. Photosynthesis is a seemingly simple process whereby plants use the sun's energy to convert carbon dioxide (CO2) into fuel — in their case, food in the form of sugars. "The equation looks deceptively simple from a chemistry point of view, but it involves hundreds of steps and many, many different components," explains Brudvig, the Eugene Higgins Professor of Chemistry and professor of molecular biophysics and biochemistry. To tackle this complicated problem, the group began meeting in Batista's basement conference room once a week to discuss their work and the progress they were making. Each member of the collaboration works on a different aspect of the problem. Brudvig and Crabtree work mostly on designing small chemical compounds that can make oxygen from water and figuring out how to attach those molecules to semiconductor surfaces. Schmuttenmaer uses laser spectroscopy to help understand the photochemical reactions (those involving light) and the movement of electrons within the system, while Batista provides the computational models that explain exactly what's happening at the atomic level, how different components work and how they can be improved. All four members work closely together. Between them, they bring to the table expertise in organic, inorganic, theoretical, biophysical and synthetic chemistry. "Our expertise doesn't overlap — it's complementary," says Crabtree. "I think that's been key. All four components are essential to finding a solution." The need to find carbon-neutral energy sources is well understood in scientific circles, and becoming more so among policymakers and the members of the general public. But the challenge is a difficult one. Current photovoltaic cells convert sunlight into electricity, but they're costly — and with commercial models operating at about 15% efficiency, they waste a lot of energy. About half of the electricity now produced is lost during transmission, and there isn't a good method to store the rest. So instead of trying to improve on current models, the team looked to nature for inspiration. During photosynthesis, plants convert sunlight directly into fuel, rather than electricity, and all they require is water and CO2. "The reason this sort of research is gaining more interest now is because, as we think about sustainable systems, water seems to be the only practical source of electrons that is abundant and cheap enough for fuel production on a large scale," Brudvig says. The Yale Solar Group ultimately hopes to develop the technology for commercial photoelectrochemical cells that would use sunlight to churn out oxygen on one end and transportation fuel on the other. Hydrogen, as the other component in H2O, is an obvious "green" fuel choice, but it's volatile, so the group is also looking at ways to potentially produce a liquid fuel such as methanol down the road. Whatever fuel is generated would be carbon-neutral, because the CO2 it would produce when burned would simply replace the CO2 that was taken out of the environment and used to create it in the first place. Today the group has expanded beyond the walls of Batista's basement room. They still meet once a week, but those meetings now include upwards of 20 graduate students and postdoctoral researchers in addition to the four chemistry professors. It's a far cry from the single postdoctoral researcher and two graduate students that the group started out with four years ago, recalls Robert Snoeberger, a fourth-year graduate student who has worked with the collaboration since the beginning. As a computational chemist, Snoeberger looks at the properties and design of light-absorbing molecules that might be useful to the group. Although he works primarily with Batista, "it's nice to get the viewpoint of the experimentalists," he says. "Usually you don't get feedback until after you publish your results." Gary Moore, a postdoctoral fellow in the chemistry department, came to Yale last summer specifically because of the work being done by the Yale Solar Group. "It's really exciting to be able to work with a group where everyone has a different background but they are all at the forefront of their respective areas," he says. "Even though they're all chemists, they all have different approaches to the same problem." Even more attractive to the students is the chance to work on a real-world challenge. "The energy crisis is at the forefront of the world's problems," Moore says. "It's not a problem finding sources of energy — it's a problem finding carbon-neutral energy. We're going to have to find a solution in the next 20 years." Moore and the other members of the Yale Solar Group are big believers in the potential of the sun's energy. The 120,000 terawatts the sun constantly showers on Earth provides enough energy in one hour to power the entire planet for a full year. But the need for alternative energy sources wasn't always recognized, even by the scientific community. When Brudvig and Crabtree started working on artificial photosynthesis in the 1980s, they were among a small number of chemists doing such research. Today, the team is happy to see alternative energy research receiving much more attention. Recently, the various members of the group received substantial federal funding as part of three different Energy Frontier Research Centers, which were established last year to address fundamental research ranging from solar energy to electricity storage to carbon sequestration in order to find novel ways to tackle the growing energy crisis. The group is involved with three of the 46 centers that span the nation, most of them hosted by universities or national laboratories and each involving dozens of researchers from different institutions. 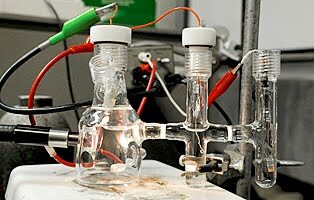 As for their own project, the group reached a major milestone last fall when Brudvig and Crabtree confirmed that they've found a water-splitting catalyst they expect will function in a photoelectrochemical cell, the device that splits water when exposed to sunlight. "We've taken a big step forward to create a system that can do visible-light water-splitting. Now we have to improve its efficiency to actually make it practical," Brudvig says. Next the team will work on creating molecular hydrogen from the ions that are present in water. Or they might focus on reducing CO2 to make methanol. Wherever the research leads, the members of the Yale Solar Group plan to continue the collaboration that has worked so well for the past several years into the — hopefully greener — future. "I would say energy is going to be the most important scientific issue of the twenty-first century because of all the implications, from warfare to poverty to sustainability," Schmuttenmaer says. "What I find really gratifying is to be part of this project where my science is now contributing to a really important problem. It makes me feel really good to know that the work I'm doing might really help the world."